Across Palestine, spring flowers are filling the landscape with their vibrant red, yellow and purple colors, welcoming in the new season and the transformative renewal that comes with it. On Friday, April 18, 2014, in the National Theater of Palestine, East Jerusalem, a different type of blossoming took place as boys and girls aged 14 to 17 from East Jerusalem took to the stage for an hour-long public performance of original songs. 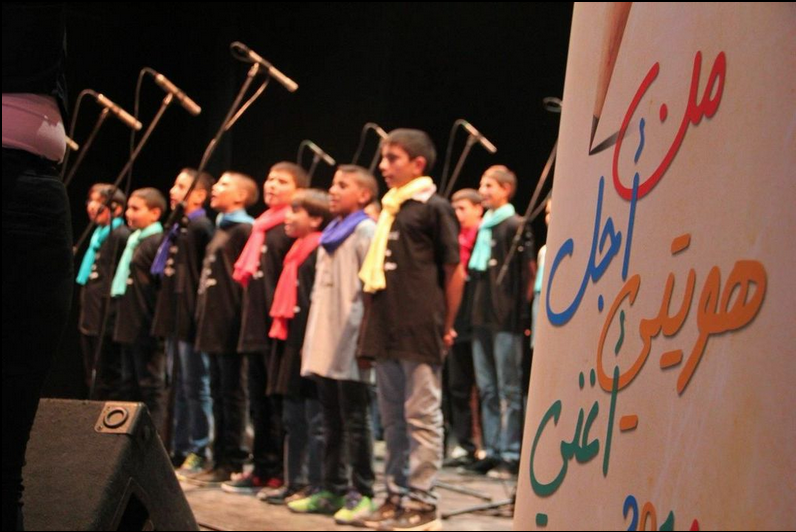 This event was the first in a series of concerts for the Al-Mada project “For My Identity, I Sing!,” an 18-month long cultural and arts education initiative, that is being completed with funding from Welfare Association. This project gives Jerusalem area youth the chance to explore their identity and issues of importance through musical and artistic expression. Very few of the youth were trained musicians, but they all participated in the collective process of writing six original songs that were performed at the concert. For many, this was the first time they had ever been on stage or performed in front of people. Not only was it incredible to see the youth engaged in the process of creating original musical pieces, it was also beautiful to see the transformation from shy and awkward youth to confident, empowered performers. One of the ideas behind this project was to overcome some of the social divisions that separate East Jerusalem area youth (and that are exacerbated by the Israeli Occupation) through creating a space where the participants can be united around the things that bring them together – their Palestinian identity, their love for the land and their people and their dreams for a peaceful future without conflict, injustice and violence. The lyrics represent these points of unity. For example, one song starts “I love life without (the) Wall/I love the sea and sailing/Moving and navigating freely through proud, noble Jerusalem/In the places of our history in the Old City”. Another song was dedicated to the Palestinian refugees in Yarmouk camp in Syria, who have suffered immensely in the ongoing political violence. The project gave the chance for participating youth to strengthen their sense of self-worth and self-confidence and to develop their views of themselves as unique individuals with something important to contribute to their society. The project bridged social divisions and supported individual and collective development through bringing together governmental (public) and private schools and youth from different religious, social and geographical segments of East Jerusalem. Project staff then worked with them on team-building, creative expression, musical activities and an affiliated social media campaign. This project built trust, individual and collective creativity, bridges and new friendships. Adorned in simple gray and black shirts with the name of the project and each one wearing a different bright, solid color scarf, the youth exuded the colors and symbolism of the spring season in their concert. Their uniforms also emphasized one of the key points of the project – celebrating Palestinian unity and collective identity, while also recognizing the unique individuality of each participant. Despite coinciding with Friday prayers for Muslims, Good Friday events for Christians and Israeli closures that made movement difficult in some parts of the city, the National Theater was nearly full of family, friends and community members and the reception from the audience members was very enthusiastic and supportive. For Al-Mada, this is additional proof of the success of the project to work across divisions and bring the Palestinian community in East Jerusalem together in a positive way. Al-Mada will host additional concerts in the coming months and will also be making a CD of the original songs created by the youth from the project. We plan to make “For My Identity, I Sing! a national campaign, that will take place across Palestine. Contact us for more information and to help us make this initiative blossom! class="post-template-default single single-post postid-750 single-format-standard samba_theme samba_left_nav samba_left_align samba_responsive wpb-js-composer js-comp-ver-5.2.1 vc_responsive"